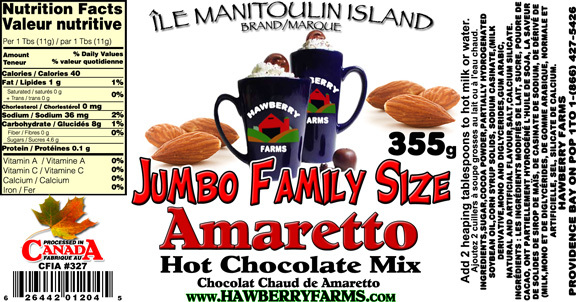 Click the button below to add the Amaretto Hot Chocolate Family Size to your wish list. Family Size Hot Chocolate! Amaretto! Add two tablespoons to hot water or milk! Ingredients: Modified milk ingredients, sugar, cocoa powder, partially hydrogenated soybean oil, corn syrup solids, sodium casinate, (milk Derivative, mono and diglycerides, gum arabic, natural and artificial flavour, salt, calcium silicate.